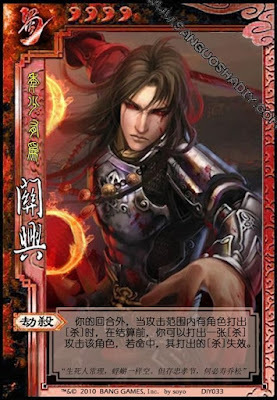 Outside of his turn, when someone within his attack range attacks, Guan Xing can attack the attacker. If his attack hits, the initial attack is voided. Guan Xing can use "Rob" even if a player is attacking Guan Xing. When Guan Xing hits a player with "Rob", the initial attack is rendered useless and discarded.